Breathing is basic, right? It’s something that we all do, all the time. We rarely realize how vital it is for living and pay no attention to getting it right whatsoever. But, by consciously shifting focus to our breath, it is possible to realize how scattered the human mind can be, and that it is possible to stay fixed in the present moment. 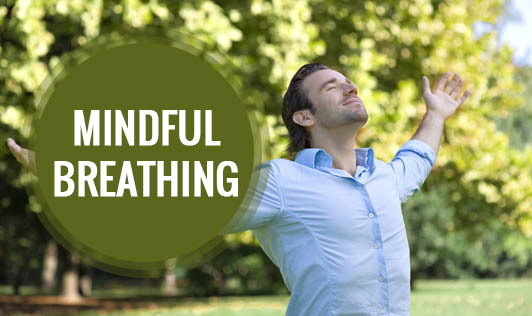 Mindful breathing is not hard, but it does need practice. You may notice initially that your mind wanders off every few minutes. It is fine if this happens as long you bring it back to focus as quickly as you can. Sit or lie down in a comfortable position. You can choose to shut your eyes or keep them open, but if you are feeling tired or stressed, it is good to shut your eyes during the exercise. Start by gradually focusing on your breathing pattern. Observe how each breath happens, how your abdomen/chest rises and falls, the sensation of air entering your nose and filling up your lungs. Don’t simply observe but also really feel what’s happening inside you. You may realize that your mind wanders, mostly because of the distractions (sounds, light) in your surroundings, but when it does, know that it is fine, and gradually bring your focus back to your breathing. By feeling or experiencing each breath, you begin to enjoy the present and try to stay connected with it. Now, slowly extend this awareness (of living in the moment) to the room around you. Open your eyes, and end the exercise. It’s now time to think about your experience during the exercise. Think about how you felt being in the present.